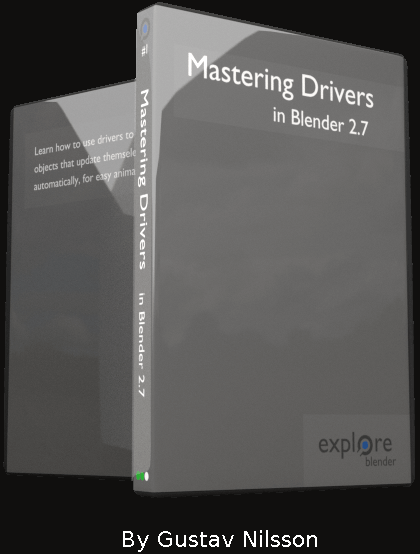 I was contacted by Gustav Nilsson a few weeks ago and asked if I would review one of his training video series "Mastering Drivers In Blender 2.7". I previously didn't know much about Gustav other than he has a blog, a twitter account,a youtube channel and a G+ page. All of which I monitor as I knew he had made/was in the process of making these training videos. It's safe to say though that I was not sure what to expect quality/skill level wise as far as Gustav's Blender knowledge goes, as I don't think I had ever seen any of his previous Blender work. Turns out I need not have worried, the quality of his tutorials are excellent. For those that don't know in Blender the term Driver means a control or value that is altered by another object/script. Drivers may not sound like a very impressive feature but when used correctly they are extremely powerful. Without Drivers achieving complex actions would have to be done entirely through scripting or using just the controls available through Blender's GUI. 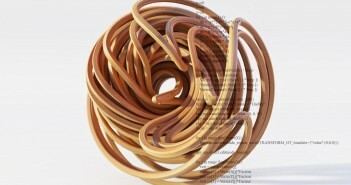 Blender's Scripting features are powerful but having to learn the Python programming language just to achieve certain effects in Blender is a little overkill, and this is where Drivers can step in. The power of Drivers comes at the cost of them not being very easy to start to use. If you don't already know about Blender's Driver feature it can be very difficult to determine how to set them up and get them to be usable. It's not a feature most people would be able to use without being told how to. Gustav's videos have the aim of teaching you both what Drivers are, how to set them up and then how to use the Drivers in various ways to achieve useful effects in Blender. The Basic course allows you to stream the video content but only at a maximum resolution of 720p. The Premium course allows you to stream the video content at a maximum resolution of 1080p, and you are also able to download the videos. The Complete course has all the features of the other courses and the ability to download the Blender source files that Gustav uses through his videos. The Blender source files will no doubt be extremely useful to those who want to pick apart how the more advanced objects work when using Drivers. I found that the 720p videos where very clear and easy to watch, so I don't think most people will need the 1080p videos, but the source files are very handy to have and they only come with the Complete course which also gives you the access to the 1080p videos. All the videos are hosted on vimeo, which supports HTML 5 video playback so you don't need flash to watch the videos just a internet connection and an HTML 5 compliant browser (Firefox/Chrome) if you wish to view them online. Gustav's narration and explanation of what he is doing in the various tutorials is very clear and easy to understand. It became apparent very quickly that he is very knowledgable when it comes to Blender's Driver system. The myriad of inventive and clever ways he uses Drivers to achieve many different tasks in Blender was amazing to watch. With the Ladder object Gustav uses Drivers to makes it's tilt, change the number of rungs and adjust the length using custom controls. The Analog Clock uses Drivers to keep track of time and automatically update its display as frames progress in an animation. The Digital Clock works very similar to the Analog Clock but shows how to animate a digital clock which keeps time. The Ladder, Analog Clock and Digital Clock are reasonably easy to understand and serve as a gentle introduction to Drivers. The remaining Simple Domino, Spider In Terrain, Advanced Domino, Glass Of Water objects are progressively more advanced in their use of Drivers and various techniques to achieve the desired functionality of the objects. These videos are not for Blender beginners, if you are totally new to Blender you will struggle to follow along with these videos. 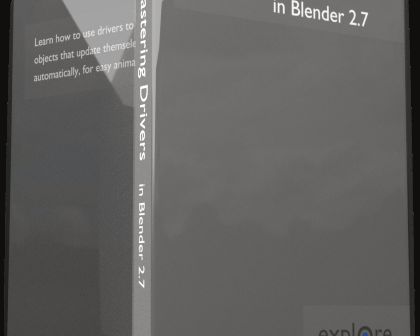 However if you are not new to Blender but are new to Blender's Driver system, do not worry. Gustav's explanations of what Drivers are and how to use them are very, very thorough. Even if you have no interest in the created objects that Gustav uses to demonstrate Driver functionality, just the information on why and how they are used the way they are is worth its weight in gold. The techniques he uses to create a glass of water which reacts to being tilted (and simulates water escaping from the glass) as it's tilted, is very impressive, but it's also advanced, you may have to watch the videos repeatedly to fully grasp how they function. As far as I know these videos are probably the best video documentation on the use of Drivers there is for Blender. Once you have gone through all these videos you will know Drivers inside and out. 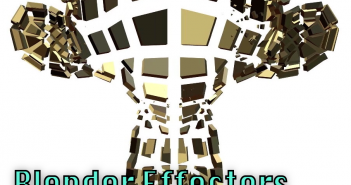 If you want to get to grips with Blender's Driver system, this series of tutorials is a must. Just remember that you will need to be paying attention in the later tutorials as they become very involved. Some could argue that some of the ways that Drivers were used in these tutorials would have been better implemented as full Python scripts, and this may well be true, but remember the purpose of these videos is to teach you Drivers. I would probably have given this tutorial series 100%, I wasn't able to do this as one of the tutorials was too advanced for me to follow (the Advanced Domino). But that is my fault not the videos (Gustav explains the Advanced Domino object very well I just wasn't able to follow it), but it did mean I had to take on faith that what was being said was correct and the best way to achieve a certain effect. Given the quality level of the other videos I have little doubt that the Advanced Domino video is done the way it's supposed to be. If you want Driver skills this is the course for you, the amount of tips and ticks I learned was stunning. I pre-ordered this when it was under development. I finally began to understand drivers once I started this course. I'm still very new at it, but I would be nowhere at all if not for the clarity of these tutorials. This videos series is very very good. I feels it's been very thoroughly thought of---the sequence in which concepts are introduced makes a lot of sense. The subject matter is in itself demanding, but I don't think it could be made much easier and streamlined than this. Could you please send me a complete list of the projects in your training video series besides of the free samples and examples?